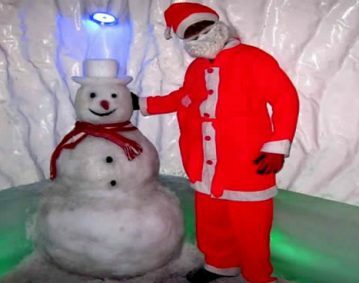 We are pleased to announce that after successful program of students’ visit of SNOW PARK last year, this year SNOW PARK again bring this program for students with offer stated as below to enjoy climate condition of below zero degree temperature and real snow play, Masti by dragging their friends on Snow sledges, Sliding on Real Ice slider, Igloos & Sculptures of snowman and penguin, Feel the thunder of snow, and much more in at SNOW PARK in our city. Students can enjoy a lot and also know how these climate conditions feel, how about snow, how our military forces work round the clock and with stand in this climate for safety of our nation, etc. Now General Public Rate are Rs.400/-(including taxes)(with all thermo wear) and Especially for Students we are offering Rs. 125/- per student (Excluding GST 28%) (Only for educational trip from school). This offer is Valid till 28th Feb’19. Entry of 1 teacher is free with each 20 students in Picnic. Also School teachers/staff & their family can avail benefit of 50% off rate (Rs. 150/- per person). For this they need to show their school ID card at ticket counter. For Students Snacks (Cost is Separate) can be provided as per the request of School.